The Sports Broadcasting Hall of Fame entered its second decade last night with a star-studded induction ceremony at the New York Hilton Midtown. Ten industry icons from in front of and behind the camera were honored during a touching ceremony, hosted by ESPN’s Bob Ley, that featured plenty of raucous laughs and heartfelt tears. For the sixth year, all table sales — totaling more than $175,000 — were donated in support of the SVG Sports Broadcasting Fund, which supports sports-broadcasting industry members in times of need. This year’s roster of honorees comprises ESPN on-air personality Chris Berman, Sportvision founder and augmented-reality pioneer Stan Honey, seminal play-by-play voice Brent Musburger, CBS Sports college-basketball analyst Bill Raftery, graphics innovator Linda Rheinstein, former MLB Commissioner Allan “Bud” Selig, Fox Sports jack-of-all-trades executive Jack Simmons, sportscasting trailblazer Lesley Visser, ESPN storytelling stalwart John A. Walsh, and renowned production exec Michael Weisman. CLICK HERE to read each inductee’s full profile. The night kicked off by honoring one of the most beloved personalities in all of college basketball: Bill Raftery. The former college coach’s career as a basketball analyst has spanned more than 32 years and includes being a mainstay for CBS and others for events like the NCAA Tournament, Final Four, the Big East Championship, Big Ten Championship, ACC Championship, and SEC Championship, as well as NBA games for the New Jersey Nets. A two-time Emmy Award-winning analyst with playing and coaching experience, Raftery combines keen analysis and opinion with unsurpassed enthusiasm and unique catchphrases. A major figure in technological innovation in sports television, Honey co-founded Sportvision in 1998 and led development of the yellow first-down line widely used in NFL and college-football broadcasts, the ESPN K-Zone baseball pitch-tracking and -highlighting system, and the Race/FX tracking and highlighting system used in NASCAR. Prior to co-founding Sportvision, Honey worked as EVP, technology, for News Corp. from 1993 through 1998. He also holds eight patents in navigation technology and 21 in tracking and television special effects. Musburger’s on-air career hit the national stage in 1975, and, for more than 40 years, he was a mainstay in living rooms across America while working for ESPN, ABC Sports, and CBS Sports. Musburger’s résumé includes play-by-play or hosting responsibilities (TV or radio) for Super Bowl, College Football Championship, Final Four, The Masters, Rose Bowl, Little League World Series, FIFA World Cup, Indianapolis 500, NBA Finals, MLB Playoffs, US Open tennis, and Belmont Stakes. Rheinstein began her career at the age of 17 as a Datavision operator for VTE and was soon a driving force in graphics design, reshaping the concept of what makes for a great sports graphic. She was the first female graphics operator in the industry and a leader in live graphics, postproduction, and special effects during the late ’70s and ’80s, when many of those technologies matured and became a key part of every sports production. In the ’90s, she helped Fox Sports create its initial graphic look. Simmons began his career in the NBC New York mailroom in 1970 and recently retired from Fox Sports, where he had been SVP of production operations. In 1987, he was named manager of planning for NBC Sports Operations and joined Fox in 1994 as director of production at the then-fledgling network. Truly a jack of all trades, Simmons was always up for any challenge and now works to help veterans join the sports-TV industry. A pioneer in sports broadcasting, Visser has had that word attached to much of her career and is the most highly acclaimed female sportscaster of all time. Among her firsts are being the only woman to be recognized by the Pro Football Hall of Fame as the 2006 recipient of the Pete Rozelle Radio and Television Award, the first female NFL analyst on TV, and the only sportscaster in history (male or female) who has worked on Final Four, NBA Finals, World Series, Triple Crown, Monday Night Football, the Olympics, the Super Bowl, the World Figure Skating Championships, and the U.S. Open network broadcasts. Walsh joined ESPN in 1988, and his fingerprints are on many of the network’s largest initiatives and launches. He retired in 2015, closing out his career as EVP and executive editor. He was instrumental in developing ESPN’s journalistic enterprise, including SportsCenter, Outside the Lines, and many other ESPN news/information products and networks. He also led creation of ESPN The Magazine and The ESPYs and, for many years, drove the editorial direction of ESPN.com, ESPN Radio, and more. Weisman’s career has plenty of highlights, including winning 24 Emmys and working on 23 World Series and MLB Championship Series and 20 Super Bowl and NFL Championship games. He was the youngest-ever producer and executive producer at NBC Sports. But his real legacy is the impact he has had with his ability to develop talent in front of and behind the camera. He’s the man who put Bob Costas in a studio role and created the announcer-coach position for Marty Glickman. In addition, he was part of the organizing team for the 1994 World Cup in Los Angeles and joined Fox Sports when it launched its baseball coverage in 1996. 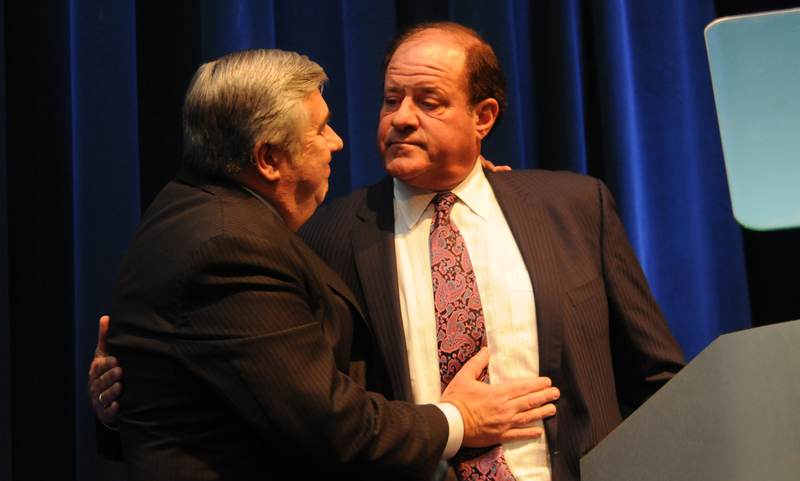 One of the faces atop ESPN’s Mount Rushmore closed out the evening: Chris Berman took the stage. Hired in October 1979 as a little-known 24-year-old sports anchor one month after ESPN’s launch, he transformed the role of studio host — and often play-by-play voice — over the next 38 years. He became one of America’s most respected, popular, and, in many ways, beloved sportscasters of his era. Blending his genuine enthusiasm, knowledge, and wit, Berman has embodied ESPN’s dedication to entertaining and informing sports fans for nearly four decades. Ken Kerschbaumer, Brandon Costa, and P.J. Bednarski contributed to this report.